Coca-Cola European Partners plc (NYSE:CCEP) investors should be aware of a decrease in activity from the world’s largest hedge funds in recent months. CCEP was in 17 hedge funds’ portfolios at the end of December. 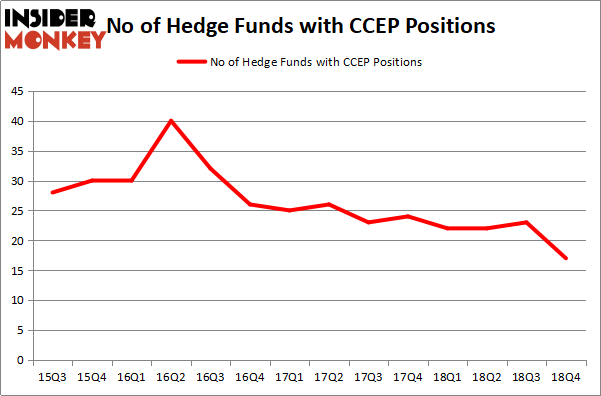 There were 23 hedge funds in our database with CCEP holdings at the end of the previous quarter. Our calculations also showed that CCEP isn’t among the 30 most popular stocks among hedge funds. Today there are many formulas market participants have at their disposal to grade stocks. A duo of the most useful formulas are hedge fund and insider trading indicators. Our experts have shown that, historically, those who follow the top picks of the best money managers can trounce the broader indices by a superb amount (see the details here). Let’s take a gander at the latest hedge fund action surrounding Coca-Cola European Partners plc (NYSE:CCEP). What does the smart money think about Coca-Cola European Partners plc (NYSE:CCEP)? At Q4’s end, a total of 17 of the hedge funds tracked by Insider Monkey held long positions in this stock, a change of -26% from the previous quarter. By comparison, 22 hedge funds held shares or bullish call options in CCEP a year ago. With hedge funds’ positions undergoing their usual ebb and flow, there exists a select group of key hedge fund managers who were increasing their stakes substantially (or already accumulated large positions). 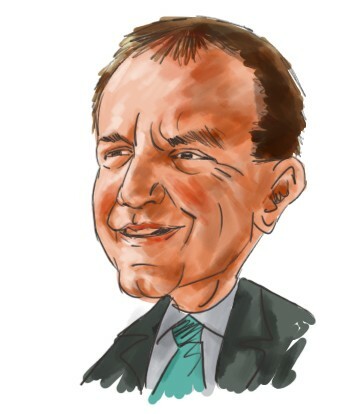 When looking at the institutional investors followed by Insider Monkey, Millennium Management, managed by Israel Englander, holds the most valuable position in Coca-Cola European Partners plc (NYSE:CCEP). Millennium Management has a $61.4 million position in the stock, comprising 0.1% of its 13F portfolio. Coming in second is Renaissance Technologies, managed by Jim Simons, which holds a $37.9 million position; the fund has less than 0.1%% of its 13F portfolio invested in the stock. Remaining professional money managers with similar optimism include Ken Griffin’s Citadel Investment Group, D. E. Shaw’s D E Shaw and Andrew Feldstein and Stephen Siderow’s Blue Mountain Capital. Since Coca-Cola European Partners plc (NYSE:CCEP) has faced declining sentiment from hedge fund managers, we can see that there exists a select few funds that elected to cut their positions entirely heading into Q3. It’s worth mentioning that Jonathon Jacobson’s Highfields Capital Management said goodbye to the biggest investment of all the hedgies followed by Insider Monkey, totaling about $102.4 million in stock. Daniel S. Och’s fund, OZ Management, also said goodbye to its stock, about $78.9 million worth. These moves are interesting, as total hedge fund interest dropped by 6 funds heading into Q3. Let’s go over hedge fund activity in other stocks similar to Coca-Cola European Partners plc (NYSE:CCEP). These stocks are Alexion Pharmaceuticals, Inc. (NASDAQ:ALXN), NXP Semiconductors NV (NASDAQ:NXPI), Tencent Music Entertainment Group (NYSE:TME), and McKesson Corporation (NYSE:MCK). This group of stocks’ market valuations resemble CCEP’s market valuation. As you can see these stocks had an average of 45.5 hedge funds with bullish positions and the average amount invested in these stocks was $1986 million. That figure was $203 million in CCEP’s case. NXP Semiconductors NV (NASDAQ:NXPI) is the most popular stock in this table. On the other hand Tencent Music Entertainment Group (NYSE:TME) is the least popular one with only 25 bullish hedge fund positions. Compared to these stocks Coca-Cola European Partners plc (NYSE:CCEP) is even less popular than TME. Our calculations showed that top 15 most popular stocks among hedge funds returned 19.7% through March 15th and outperformed the S&P 500 ETF (SPY) by 6.6 percentage points. Unfortunately CCEP wasn’t in this group. Hedge funds that bet on CCEP were disappointed as the stock returned 7.6% and underperformed the market. If you are interested in investing in large cap stocks, you should check out the top 15 hedge fund stocks as 13 of these outperformed the market.